There are a whole bunch of possible ways when it comes to building a foundation. Although the studio did not need to be subject to building regs we were building an extension nearby that was. 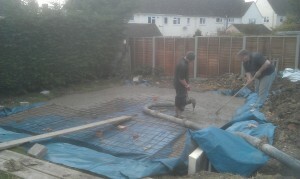 During one of their visits the regs officer was kind enough to give us some advice on the studio footings too. The studio (at the time) was close to a bunch of Leylandii ‘trees’. For those who don’t know, Leylandii are bastards. They grow about 1 meter per year even in naff soil. These ones were massive. I have since got fed up with them and went at them with a saw, there’s now a nice fence there instead. As a result of the trees, the Regulations Inspector suggested that we either go for deep foundations or consider going for a solid, steel reinforced concrete base. We dug out the floor of the studio 200mm deeper than it would be when we were finished. We dug a trench around the outside just over half a metre deeper than the floor. We lay 100mm Celotex insulation board so it was to go beneath the floor. We covered the insulation and bottom of the trench with polythene membrane. We set up a steel mesh over the floor and going down into the trenches. We poured a hell of a lot of concrete into the hole until it was floor level. This step is shown in the picture below, apologies for the state of my phone camera. I’m not sure of the exact costs as we were also pouring a footing for some decking and a wall running up to the studio at the same time. But the total bill for the pouring phase came to just under £600 for the materials, £250 for the concrete pump and about the same again for labour. Total: ~ £1,100 for the pour. Other items involved in the footings project were the insulation (about ~£40 for a 1.2m x 2.4m board) Digger Hire and skips for the excess dirt. In my case I’ve used much of the clay that we dug out of the footings for a garden landscaping project, this has saved a fortune in skips. Total bill for the footings I would estimate at around £2000. You would need to allow for more for skips if you didn’t have a landscaping project in mind for all the soil you pull out. Looking back, my choice of single pour solid base may be the start of my first mistake with the studio. I’m not sure if it was a certain thing then, but I have ended up with a wood beam floor in the studio. The wooden floor is supported by beams above the concrete base with an air gap between for ventilation. This floor has the potential to resonate like a drum and will be a constant pain going forward. I am where I am now and I can’t afford to change this. But I would recommend anyone else at this step stop to research and ask if there are alternatives to this configuration either available with the solid, single pour base or by going with a different kind of footing. I would be much happier if I could stand directly on the concrete base.